This has been top of mind for a few years now — the experiences vs things showdown. We’ve all seen the headlines — spending is shifting from things to experiences. FOMO is the new “keeping up with the Joneses.” Blame Millennials for your favorite thing-based business going out of business. That conclusion probably isn’t too surprising. It falls in line with the media headlines you’ve likely seen. However, this next study rocks the “experiences = happiness” boat a little bit. Great, thanks for nothing, conflicting research! Well, kind of conflicting research! Things Aren’t All Bad, Alright? Aside from that most recent research study in 2017, I don’t think I’ve seen anything that says spending on things offers equal or greater happiness than spending on experiences. I think there are plenty of material things that can add happiness or utility to your life. If you practice some form of minimalism, you still own some things. Even the people who post articles like “The 15 (or 51 or 288) Things I Own” still own 15 or 51 or 288 things. Maybe you live by the philosophy of “less but better” from Essentialism. That same philosophy can apply to physical goods — buying durable, long-lasting things that go on the journey of life with you. And, because you are a minimalist, you likely have less things in general and have intentionally hand-picked the few things you do own. The perceived and tangible value of those few things can be very high. Happiness! Our memories can change because each time we revisit them they become vulnerable. When we first lay down a memory, it takes the brain a little while to solidly store the information—a process called consolidation. And every time we subsequently recall that memory, it has to go through a new storage process—another slight delay for another consolidation. During that window, new information can interfere with the old information and alter the memory. Phelps says it is like playing the school game of telephone, where one student tells a short story to a second student, then that person retells it to a third, who tells it to a fourth, and so on. By the end of the chain the story is usually quite different from how it began. Maybe it’s just me, but I’ve got a pretty questionable memory to begin with — adding the telephone game only makes it worse. I usually can’t even remember a basic experience like a dinner out. I can’t remember if I’ve ever even been to certain restaurants much less what I ordered, if it was good, what the service was like, etc. This same thing applies to travel experiences for me once enough time passes. Another interesting thought — does recalling experiences trap you in the past? The primary philosophical challenge of thought experiments is simple: How can we learn about reality (if we can at all), just by thinking? More precisely, are there thought experiments that enable us to acquire new knowledge about the intended realm of investigation without new empirical data? So, what is the thought experiment related to experiences vs things? It’s not possible for you to run a real experiment to play out the rest of your life in front of you. So, you need to understand yourself and have a vision for your life to consciously decide on experiences vs things. I do believe there’s a common denominator to both: spending money. 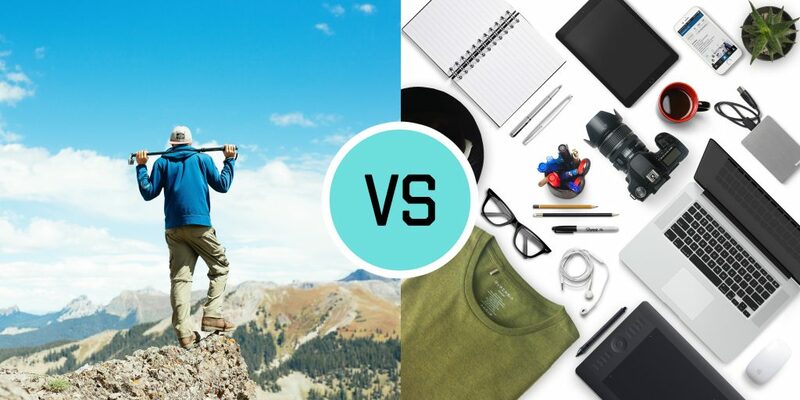 Does spending on experiences vs things make you happier? Or, put differently, is spending on one more dangerous than the other? Aren’t they both forms of lifestyle inflation? What about the other element of spending your only non-renewable resource: spending time? Is the spending a form of escapism regardless of whether it’s on experiences or things? There are only 24 hours in a day. Is the spending on experiences more dangerous because of the amount of time you may spend planning, anticipating, experiencing, and recalling the experience? The answer to this thought experiment is, of course, up to each individual. For me, it simply comes down to balance. I try to avoid escapism at all costs these days and confront life face to face. At the same time, I’m happy buying some durable, long-lasting things and engaging in some (hopefully memorable) life experiences. It’s just the balancing act between them and in moderation. Last year, I spent $0 on clothing for 6 months. But, the money I saved on things didn’t transfer to experiences. Given that there’s a legitimate question of whether or not Millennials will ever retire, I felt it was more important to begin applying some of the principles of FIRE (Financial Independence Retire Early). Pro Tip: Ask yourself “why” you are spending before every purchase. Actually, ask “why” 5 times. If this makes you identify the spending as a form of escapism, reconsider the purchase. This is a big question. Big enough that I thought it warranted a thought experiment. I don’t think the answer can really be answered in research studies. I’d love to know if you have a perspective on experiences vs things. Please share any thoughts you have in the comments. For me, the joy I get from having an experience (a night out, holiday, volunteering) lasts longer and is recalled far more often in my heart and mind with joy than any purchase I have ever made. I can imagine, perhaps, buying my first house will be one of those moments (but you could argue this is an experience purchase) but other than this I value experience spending more than material spending. Thanks for putting the thought experiment into my head! Thanks for the comment, Andrew! Glad you enjoyed the thought experiment. The beauty is that the answer to the experiment is up to each individual. And, experiences definitely get a bonus point for being less prone to social comparison. The joy you get is up to you to determine! Great article! I think that experiences matter more than things because it relates to enjoyable ways we spend our time and relating to others as the first study mentioned. HOWEVER, other than the lost earnings from your time whoever said experiences need to cost a lot? I think a walk with a friend in a park is at least as memorable and meaningful as meeting them for a meal in a restaurant. I think a camping holiday somewhere near home will be just as memorable for our kids as taking them overseas. I know our simple little wedding on the beach with 20 guests was as, if not more, memorable than if we had had 200 guests, a professional photographer etc etc. I also think people often forget how harmful travel is on the environment. GREAT point, Melody. I’ve actually seen more and more posts about inexpensive ways to have fun. After all, the best things in life are free!